After warning us last week of their impending dual-booting tablet, ViewSonic has now spilled the beans on the ViewPad 100's specs. I don't think anyone will be impressed by the Android 1.6 flavor, even if Windows 7's also there too. I can't think of many reasons why someone would want a dual-booting tablet, but obviously dual-booting laptops (running something like Parallels or Boot Camp) certainly serve a purpose. This could be the tablet for people to tinker with, but it's still a fairly niche market that Viewsonic's shooting at. With a 10-inch screen (they describe it as an LED display with 1024 x 600 resolution), it runs on an Intel Atom N455 1.66Ghz processor with 1GB of DDR3 RAM, and has a 16GB SSD. Wi-Fi, Bluetooth, a G-sensor, A-GPS, two USB ports, a miniVGA and microSD card slot (expandable up to 32GB) are all present, along with an inbuilt 1.3MP webcam. 3 September 2010, IFA, Berlin – ViewSonic has announced the launch of the world's first dual-boot tablet, the ViewPad 100. 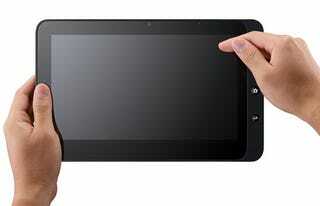 With a 10" screen, the ViewPad 100 incorporates both a full version of Windows 7 Home Premium and Google Android 1.6. The combination of operating systems means that users have the speed and portability of an Android-based OS without sacrificing the power and compatibility of a Windows powered system. Users can quickly check their emails or browse the internet with Android while still being able to rely on the traditional PC experience that a full Windows environment provides, such as USB connectivity, video output via mini VGA, Adobe Flash support and the ability to create presentations and word documents from scratch. With a lightweight design, the ViewPad 100 is ideal for anyone who needs a portable computing solution. It features a built-in 16GB SSD, giving faster boot-up and read/write times than standard HDDs, as well as an energy-efficient Intel Atom N455 1.66Ghz processor with 1GB DDR3 RAM, providing users with longer battery life. "We want to supply users with a tablet computer that incorporates both Android and Windows as we believe in providing an open approach to mobile technology to users who may not wish to be tied to a specific operating system," says Derek Wright, European Product Marketing Manager. "The ViewPad 100 is aimed at those who want the speed and portability of Android without losing the advantages of having a Windows-based system. We recognise many users may be transitioning from a netbook but will possibly struggle with the learning curve of a new OS, even for simple tasks as uploading photos or using a VPN. Eventually they may choose to favour one over the other, but they will always have the choice." The user experience is further enhanced by a high quality capacitive multi-touch display based on a 10" 1024 x 600 LED panel as well as built-in Wi-Fi and Bluetooth connections and a G-sensor that reorients the screen depending on how the device is held. Additional features include a Micro SD slot for up to 32GB of storage, Assisted GPS for navigation, two USB 2.0 connections and a built in 1.3M webcam.